For as long as I can remember, I've been obsessed with having long hair. It's just so glamorous, fun, gorgeous, hard to deal with, yet worth it all. Back in October, I got a trim and I feel like it's taking forever to grow back! Don't get me wrong, my hair is much longer than most people, but I want it extra long. Insert where I need your help. On Friday, a friend of mine suggested that I try taking Biotin. I'd never heard of it, but apparently it's super popular. On Saturday night, I was having a girls game night and someone started talking about she had gotten her hair so long because of Biotin. Although I love my extensions and wouldn't know what to do without them, it gets rather old having to use them so often. So in addition to Biotin, do you ladies have any suggestions? I have yet to find something to help with hair growth, so if you find something please share! 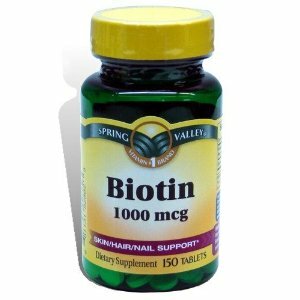 The main thing I notice with Biotin is my nails, and maybe the overall condition of my hair. I love it! It REALLY helps with my nails though since they can be thin otherwise. I only take one a day though, which is a 2500mg capsule. I will suggest staying away from other brands though. I first took it using the NatureMade brand but switched to the Target brand since it's cheaper. and I noticed a BIG difference. I just switched back to NatureMade.